The Occupy Wall Street movement began its fourth week Saturday with protests around the world in what organizers called an international day of solidarity. Occupy Wall Street protesters fill Times Square for a rally Saturday, Oct. 15, 2011 mixing with gawkers, Broadway showgoers, tourists and police to create a chaotic scene in the midst of Manhattan. 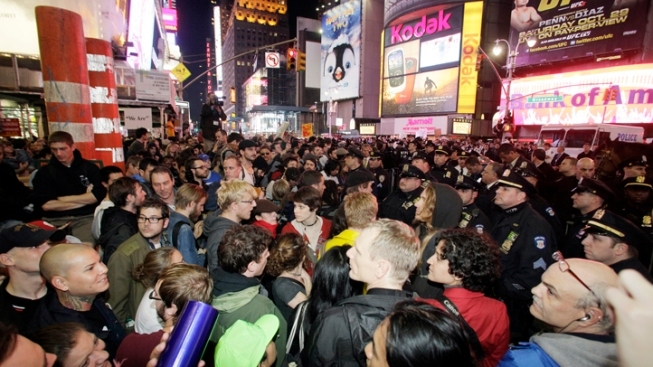 New York police have arrested 92 people in connection with the weekend Occupy Wall Street demonstrations against corporate greed. The latest arrests came in the early morning hours on Sunday at Washington Square Park, when police took 14 people into custody for violating a midnight curfew at the park. Other arrests were made Saturday at locations including Times Square and at a Citibank branch in LaGuardia Place. In Times Square, thousands of demonstrators mixed with gawkers, Broadway showgoers, tourists and police to create a chaotic scene in the midst of Manhattan. 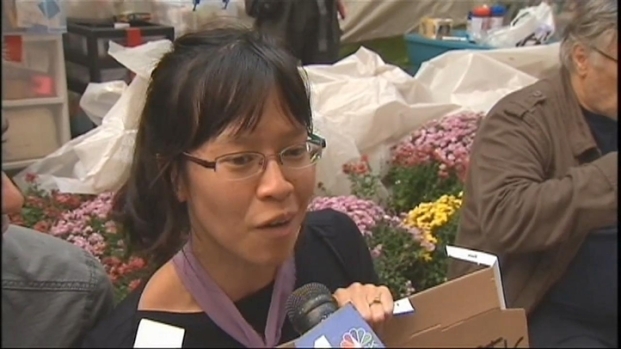 Many protesters have camped out for Occupy Wall Street for weeks or even a month. On the brink of being forcibly removed from their camp, News 4 talks to one couple that showed up for the first time, to show their support. "Banks got bailed out, we got sold out!" protesters chanted from within police barricades. Police, some in riot gear and mounted on horses, tried to push them out of the square and onto the sidewalks in an attempt to funnel the crowds away. Sandra Fox, 69, of Baton Rouge, La., stood, confused, on 46th Street with a ticket for "Anything Goes" in her hand as riot police pushed a knot of about 200 shouting protesters toward her. "I think it's horrible what they're doing," she said of the protesters. "These people need to go get jobs." The owner of Zuccotti Park notified protesters that the park will be cleaned on Friday, and that afterwards, new regulations will be enforced which will prohibit everything from camping out to storing personal property on the ground. News4's Ida Siegal reports. The Times Square rally lasted several hours before the crowd dispersed. In the weekend arrests, police cited violations such as wearing masks, criminal trespass, and refusing to leave the park at midnight when police warned them it was closed. NYPD spokesman Paul Browne said three police officers were treated and released for injuries. 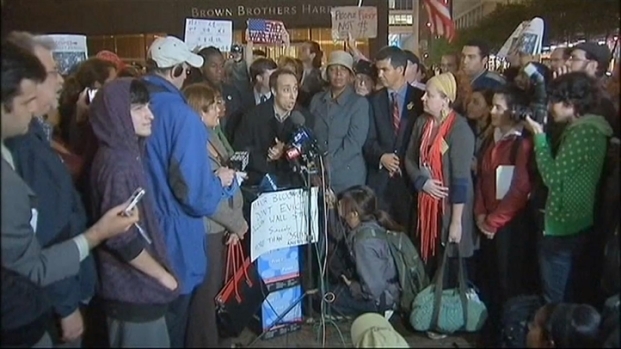 Citibank said in a statement that police asked the branch to close until the protesters could be taken away. "One person asked to close an account and was accommodated," Citibank said.